Good news to all Hello Kitty lovers out there! 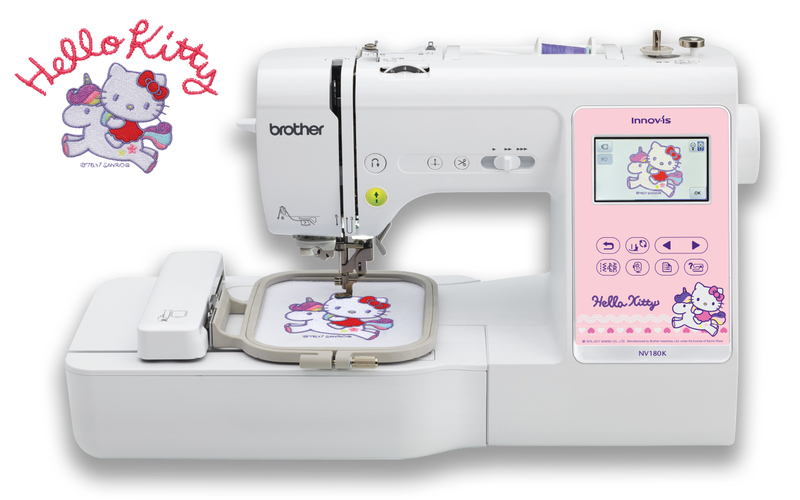 Brother has launched a special edition of Hello Kitty home sewing and embroidery machine, NV180K. This multi-function machine combines sewing, quilting and embroidery features with the latest innovation and technology. NV180K sewing and embroidery machine comes with 134 built-in embroidery patterns that includes 54 exclusive Hello Kitty embroidery patterns Sanrio designed for Brother. NV180K, the 2nd generation of Hello Kitty sewing and embroidery machine, spot a 8.2 cm x 4.5 cm colour touchscreen LCD. This means users are able to do simple on-screen editing and operate the machine intuitively and easily. The machine’s 10 cm x 10 cm embroidery area provides ample space for sewers to enjoy the multiple built-in decorative stitches and embroidery designs at their own comfort. These new functions bring Hello Kitty fans and sewing enthusiasts to the next level of creativity. The NV180K is the ideal machine for sewers at all skill levels. The automatic needle threading, drop in bobbin and easy bobbin winder system are features that will help seasoned and new sewers to quickly and easily set up the machine. NV180K combines Brother’s quality and reliability with the latest innovations from the company’s state-of-the-art product development labs in Japan. The newly developed and Brother exclusive patterns are aimed at hobbyist and crafters from adults to children. Next articleMade for your enterprise. Built for performance.